Sixty-percent of the world’s geysers are found in Yellowstone National Park and the most famous of all is Old Faithful Geyser. Like Biscuit Basin, Old Faithful is found in Yellowstone’s Upper Geyser Basin, an incredible one square mile area that contains over 150 geysers. Old Faithful Geyser has soaring bursts and is one of Yellowstone’s most predictable geysers, erupting about every 90 minutes. 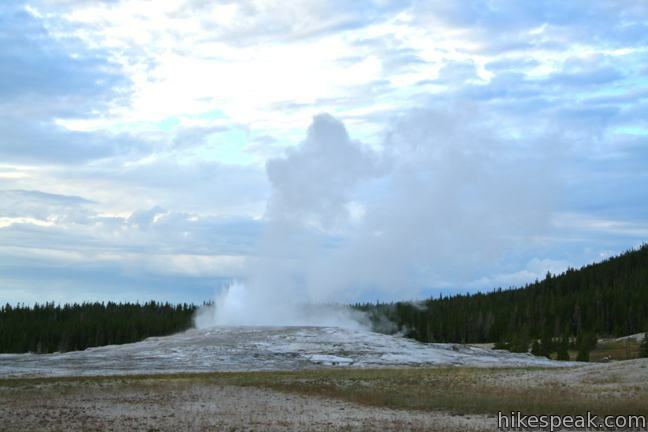 Witnessing Old Faithful Geyser in action is an almost mandatory stop on every park visit. 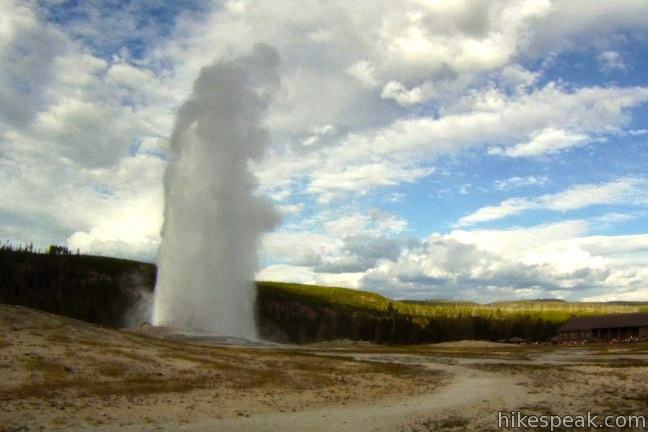 You don’t have to walk a great distance to see Old Faithful. There is a big parking lot nearby and ample viewing room around its base for the ever-present gallery of gathering admirers. The first non-natives to see Old Faithful (and explore what is now Yellowstone National Park) were the members of an 1870 expedition lead by General Washburn. When these men discovered a large and predictable geyser that amazed them so much they gave it a name. The title stuck, making it the first named geyser in Yellowstone, Old Faithful. 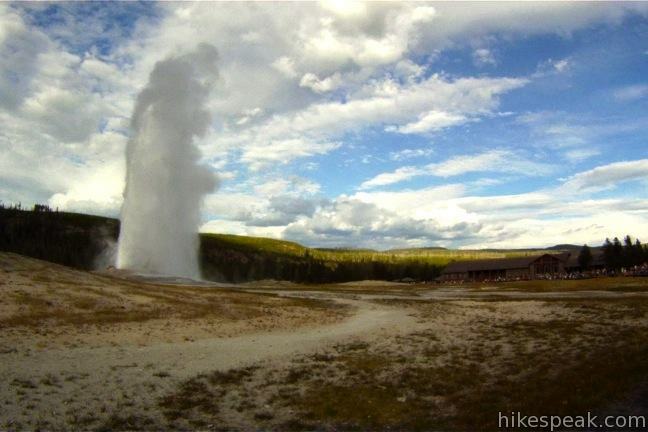 Old Faithful Geyser by hikespeak.com. 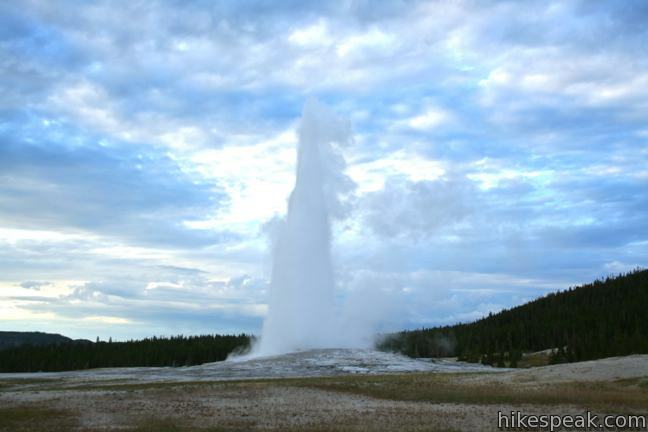 What makes Old Faithful special? Old Faithful erupts more frequently than any of the other big geysers, although it is not the largest or most regular geyser in the park. Its average interval between eruptions varies from 60 – 110 minutes. An eruption lasts 1 1/2 to 5 minutes, expels 3,700 – 8,400 gallons (14,000 – 32,000 liters) of boiling water, and reaches heights of 106 – 184 feet (30 – 55m). It was named for its consistent performance by members of the Washburn Expedition in 1870. Although its average interval has lengthened through the years (due to earthquakes and vandalism), Old Faithful is still as spectacular and predictable as it was a century ago. If you arrive at the Old Faithful Visitor Area during the geyser’s down cycle, there are several ways to fill your time while you wait. First you can check out the diorama and interactive exhibits at the Old Faithful Visitor Education Center and learn how Old Faithful and other geysers function. 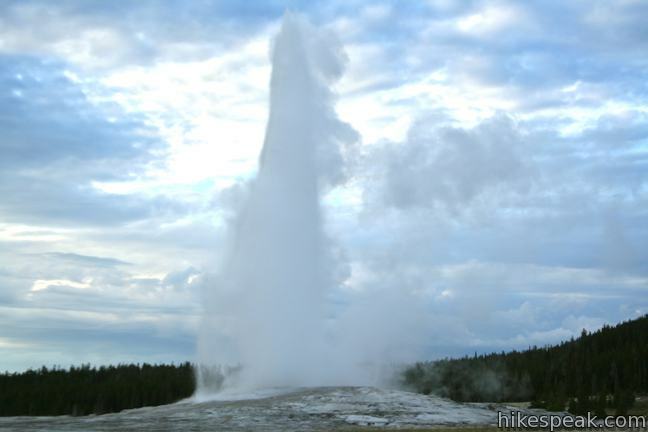 What makes a geyser erupt? 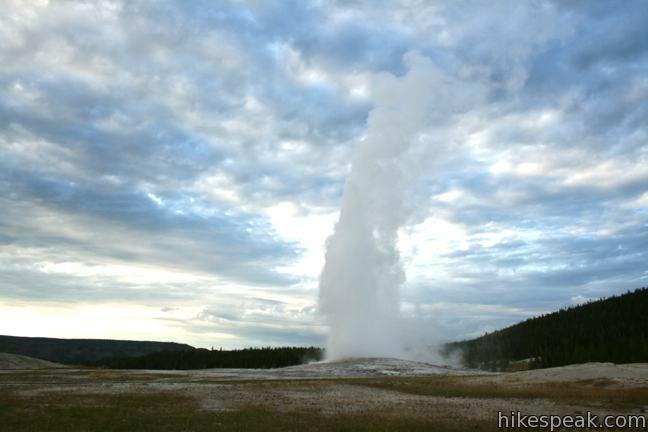 A geyser is formed when water collecting underground is heated by a magma source. As the water warms, it rises toward the surface. If the water has an unobstructed path, it will pool on the surface in the form of a steaming hot spring. If the passage of the water is imposed upon, the pressure will increase. When the pressure becomes too great, the water converts rapidly into to steam. Steam takes up 1,500 times the volume of water, and at this point, the pressure becomes so intense that the steam and surrounding water droplets shoot out of the ground in geyser form, erupting until the pressure has abated and the process starts all over again. 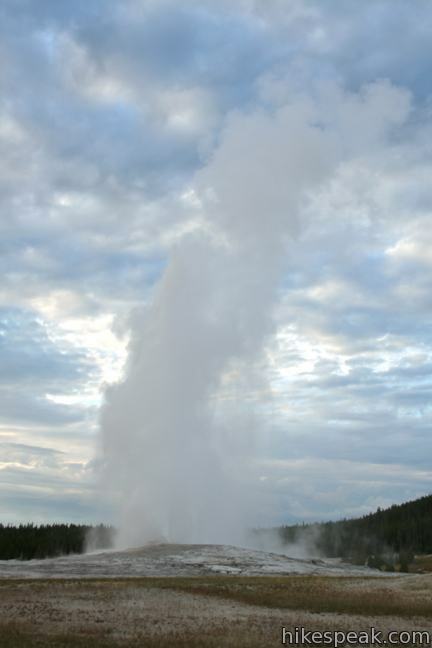 It takes Old Faithful about 90 minutes to recharge after each eruption. In addition to the visitor center, historic grand wooden lodges that were built around Old Faithful to cater to early park visitors are still popular destinations today. Old Faithful Inn was built in 1903 and Old Faithful Lodge was built in the 1920s. There are several businesses around Old Faithful where you can grab something to eat and those essential souvenirs. For hikers, short trails extend beyond Old Faithful to other geysers and hot springs in the Upper Geyser Basin. Some of the named hydrothermal features in the surrounding area are Anemone Geyser, Aurum Geyser, Beehive Geyser, Castle Geyser, Crested Pool, Doublet Pool, Giantess Geyser, Grand Geyser, Heart Spring, Liberty Pool, Orange Spring, Plume Geyser, Sawmill Geyser, Spasmodic Geyser, and Turban Geyser. 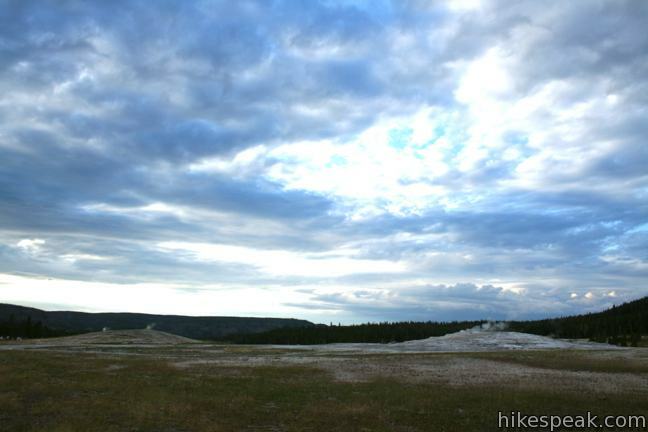 You may also wish to take the 2-mile round trip trail up to Observation Point, which is 250 feet above Old Faithful, presenting a grand overview of the geyser basin. In addition to these trails, If you drive a few miles up Grand Loop Road, you will find several boardwalks through nearby hydrothermal areas. Check out the short interesting hikes through Biscuit Basin, Midway Geyser Basin, and the Fountain Paint Pot Area. 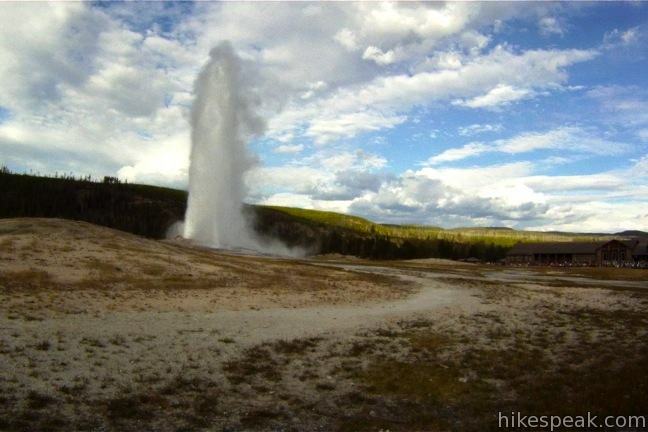 If you simply wish to walk along the boardwalk around Old Faithful Geyser it can be a half-mile round trip hike. No extra fee or permit isrequired to visit Old Faithful Geyser, but Yellowstone National Park does have an entrance fee. Stay on the boardwalk. Do not walk on or touch any hydrothermal features. Old Faithful is not a wishing well, so do no throw anything in. To get to Old Faithful Geyser: From Madison Junction, drive 16.5 miles south on Grand Loop Road (Route 89) and take the exit for Old Faithful, driving east into the large parking area. From the West Thumb of Yellowstone Lake (near West Thumb Geyser Basin) drive 17 miles west on Grand Loop Road to the Old Faithful Visitor Area. Old Faithful is 2.5 miles south of Biscuit Basin, 6 miles south to Midway Geyser Basin and 8.5 miles south of Fountain Paint Pot Trail. This 2/3 of a mile loop explores a hydrothermal area on the shore of Yellowstone Lake. This 2/3 of a mile loop explores hydrothermal features in Upper Geyser Basin like Black Opal Pool, Sapphire Pool, and Black Pearl Geyser. This 0.8 mile walkway passes Excelsior Geyser and Grand Prismatic Spring, the largest hot springs in Yellowstone. This half-mile loop in Lower Geyser Basin passes geysers, hot springs, mudpots, and fumaroles - all of the hydrothermal features found in Yellowstone. Great photos! I have always wanted to see this, but haven’t got a chance to get up to Yellowstone. Looks beautiful though through your posts. Such a wonderful world! 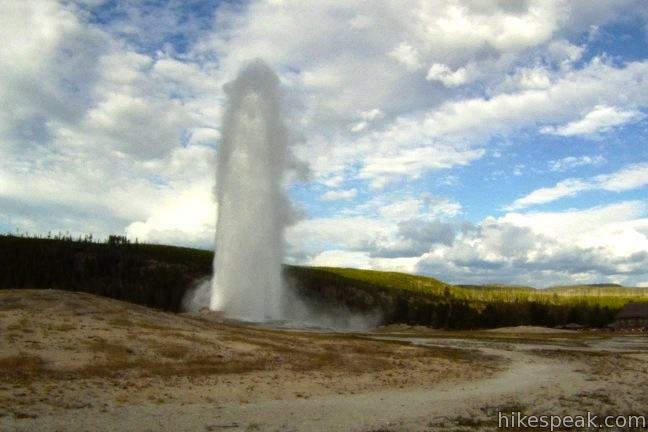 I can’t believe how this geyser always excites us! I was there in June of 1941 for a week and Old Faithful erupted about every 60 minutes and if you were anywhere around everyone would go to watch again it was was so magnificent. How far of a walk to see old faithful I have P.A.D. and walking is very difficult. But… i want to see it so bad. 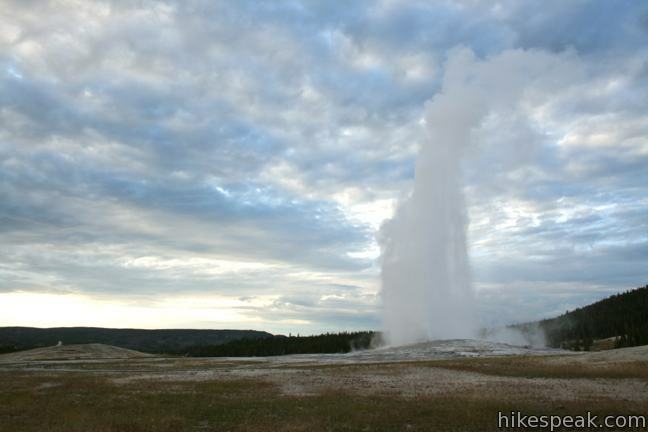 It is possible to see Old Faithful without walking more than 100 yards each way. You may need to be dropped off at the edge of a parking lot close to the geyser. Is it possible to walk from Lake Lodge/Hotel to Old Faithful? 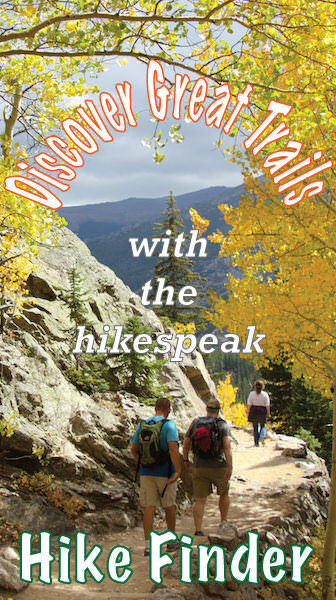 How long would ut take and woould you consider it hard, moderate or easy hike? Thank you. I heard today Jan.4, 2019, that Old Faithful would not be faithful any more. What’s going on? ?